Cars, Get off the Road! Not every encounter is life threatening, some are simply stressful. I don’t know if everyone thinks that just because a bike lane or trail is nearby that the cyclist must use it. There is no law in the DC Metro Area stating cyclists must use bike lanes. In most cases, the cyclist WILL use them because they are at least some space set aside. But the times I don’t are when my line of travel is taking me in a different direction than the trail “trails” and I must be ready for narrow roads or some kind of obstacle I must negotiate up ahead – an obstacle most drivers take for granted as a non-problem. There are a hundred case-specific arguments in favor of not using the trail or sidewalk while on a bike. The most important one is that sidewalks are narrow and MUST be given over to pedestrians for their safety. Just think when the trails are ridden, say the Mt Vernon Trail, the Capitol Crescent or the W & OD, the walkers and joggers move so much more slowly than cyclists and prove to be a little challenge to negotiate from time-to-time. It’s even more dramatically different on sidewalks. It is simply safer for pedestrians and children on bicycles to be able to “own” the sidewalks. That being said, it is perfectly legal for a bicycle to ride on the sidewalk in some places even while it is illegal in others. 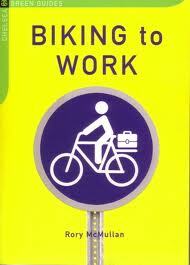 I much prefer to think of bicycles as machines designed for roadways (except certain highways and interstates). There should be some places that cars can also expect to get up to full speed over distance. 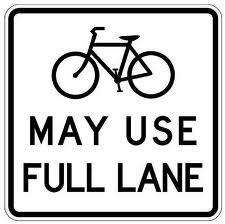 It is also perfectly legal for bicycles to ride on the road – either toward the right of the lane or taking the whole lane. Each scenario determines what is most safe. That is what matters mostly – safety – not impatience or perceived right-of-way by motorized vehicles just because hey are motorized. The truth is drivers of motorized vehicles HAVE NO RIGHT to yell at bicyclists to get off the road or to get on the sidewalk. They don’t even have the right to arbitrarily honk behind them as they speed by (though many drivers do choose this option). Honking creates more of a problem than just passing safely with three-feet separating the vehicle from the bicycle. Bicyclists ALREADY know there are drivers all around them. Honking does not help the cyclist. It also does not help if the driver opens their window and screams “Get off the road” or “Get on the sidewalk.” The bicyclist may choose to ride on the sidewalk, but it is the cyclists choice. What if the cyclist yelled those same words at each car they passed or that passed them? Might this be an absurdity? In fact, with the status of bicycles in contemporary culture and their legal status as a transportation mode, it is just as absurd to yell them at bicyclists. Helmet manufacturers usually state their helmets should be replaced every three to five years. The reason for this is the increased viscosity of the foamy material – it grows harder over time in the air and even faster as it absorbs the rider’s sweat. As a result, helmets are less likely to absorb life threatening impacts over time because what used to crunch softly and absorb starts to harden and force those impacts into the rider’s head. Not a good thing obviously. I see a lot of decades-old helmets on riders – riders who commute all the time. My experience has shown me that when I mention this fact to these helmet wearers, they reply by saying they have not had any crashes and they don’t see any cracks in their helmets. Except most of the meaningful wear in one’s helmet is invisible to the eye for the aforementioned reasons. The more the helmet is worn, the closer to the 3 than 5 will be the time for that particular rider’s helmet’s replacement. OK, let’s say the rider has heeded my (and others’) safety advice and bought a new helmet. Now it needs to be worn correctly. 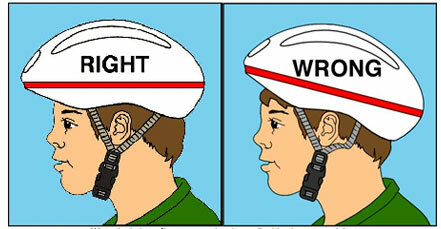 I cannot count the number of incorrectly worn helmets I see weekly on my rides and commutes. Correct placement of the helmet on the head is level to the ground. This will involve reading the little booklets included with EVERY helmet purchased. Those strap adjusters that come together should be set just below the ears after the straps have been adjusted accordingly to balance the slight forces coming together from straps being brought from different angles to one single strap that then goes under the chin (not too tightly 🙂 ). I hope this makes sense. Just a thought. Ride safely. Have fun. Don’t hesitate to ask questions below or @Twitter.